With broken fingers. On Christmas. I was on Prince Street, and it was 4:45 in the morning. Dark, of course. It’s a good time to be walking the streets of our city. It’s quiet. You can walk down the middle of the street without fear of being run over by an Uber or a delivery man on a silent bicycle. You pass store windows decorated with blinking Christmas lights, fake snow on the product of the day. Empty restaurants illuminated from within, the chairs upended upon the tables that have served the ghosts of, what, thousands of diners. The steam escaping from the bowels of our city, directed through orange pipes up towards the black night sky. On Prince Street, once the home of Italian immigrants, I heard a woman singing out to her heart’s delight, at 4:45 in the morning. She had one of those warbly opera-tic voices, but man, such volume! And although I couldn’t always make out the words—was she channeling Italian voices from this street’s past?---there was a joy in each melodic pronouncement. It was the kind of song that you sing when you have good news in your life, or new love, or just because you are alive. She didn’t give a hoot about who heard her, or maybe she did. Maybe she wanted to wake up everyone struggling through their just-before-waking nightmares with a song of great jubilation. Whatever the reason, she lifted my spirits. My wandering continued as the light finally began to dawn over this city that I love. With every new level of bright, it comes awake. Stores open, people spill out of subway entrances, trucks and cars rumble down the street. Somewhere near Chinatown, I saw this family walking through the park, a father and three children. Two of them seemed like zombies, silently sleep-walking with backpacks and mittens. But lagging behind was a little boy, maybe 5 years old. His feet were askew, and one leg looked smaller than the other and turned outward. He hobbled along, but naturally. This was no recent injury, but a deformity, and it seemed to bother him not at all. He was inspecting all the garbage along the way—the sidewalk littered with all our disposed chairs and posters and vacuum cleaners and items of our consumption, consumed, used up, discarded. He seemed to be fascinated by all of it, curious, amazed, lagging behind his father and two zombie siblings. The father’s insistent voice calling him to keep up, to hurry, to be with them. Finally he whistled at him, and the little boy looked up, smiled, and somehow put speed into his lopsided, bent hopping with the beautiful motion of a ballet dancer, but wait, wait, because when he neared his father’s outstretched arm he scrambled up onto the man’s back with such grace and speed, giddily laughing at his father accepted him like he was throwing on a living cape, two little arms clasping his father’s neck as the man tickled his son’s contorted, mangled body. They both laughed, their joy unnoticed by the zombie siblings, and the laughter bounced off the storefronts on one side, the passing trucks on the other. I stopped for a moment, overwhelmed to tears by this little scene, and watched them disappear around a corner. There was a Christmas advertisement in the window of the store next to me. A perfect-looking gorgeous woman being held by a perfect-looking hunk of a man in front of a perfectly looking car that was the real point of the photograph. I wonder where these people live, I thought. I have never met anyone who looked like them. But my heart couldn’t forget that little boy. He stayed with me as I continued my walk. How he seemed utterly unfazed by his deformity, the challenge of his limbs; how he seemed to embrace the world all around him, reveled in it, laughed amidst it. I loved watching the father and son, the zombie siblings walking together down that street. As a friend once said, it all seemed utterly holy to me, a gift, a sign, a reminder, a letter from the Light. Jeremy and Chris have been trying to have a baby for at least five years. I can’t tell you how many prayers were said, how much sadness they endured with miscarriages and false hopes. And finally almost 9 months ago, a life was created within. It’s been a nerve-wracking pregnancy, and extremely delicate, and they have been walking a tightrope lo all these months. But the Little One seems ready to arrive into the world. The incarnation, this incredible manifestation of holiness into our world. It makes you want to sing operatically in the middle of the street. It makes you want to open your arms for love to climb up onto your shoulders and drape you like a cape. It makes you want to embrace the people all around you—your husband, your wife, your children, your mama or papa, your siblings and cousins and aunts and uncles, your friends, the guy who serves you coffee in the morning in Dunkin Donuts, the woman who bags your groceries at Gristedes. I got back here to the church. My task for the day was to set up a creche scene in front of the tree outside on the plaza. The Holy Family have holed up all year long in one of the unused confessionals, so I unlocked it and took Mary and Joseph out to the plaza. It wasn’t Christmas yet, so I kept the baby Jesus out of the picture. I took him out of the confessional and sat down in one of the pews and held him in my hands. Two of his fingers are broken off, and I had been considering how to mend them. But as I held him, I loved him all the more for his broken fingers. Every day I read the prayers that people leave in the Narthex on little slips of paper. Every day I pray for the people who are mentioned in them. Who is hurting because their mama is dying, who is pleading to God to have their children return home, who is agonizing over financial troubles, or a cancer treatment, or the loss of the love of their life, who doesn’t believe they are loveable, who wishes sometimes that God will show them just a little bit of mercy, who feels condemned because they are gay, or divorced, who feels ugly, or dumb, or lost or a failure. Every day I see people all around me who look OK, maybe even picture perfect-looking, but I know that we are all of us not. The incarnation. 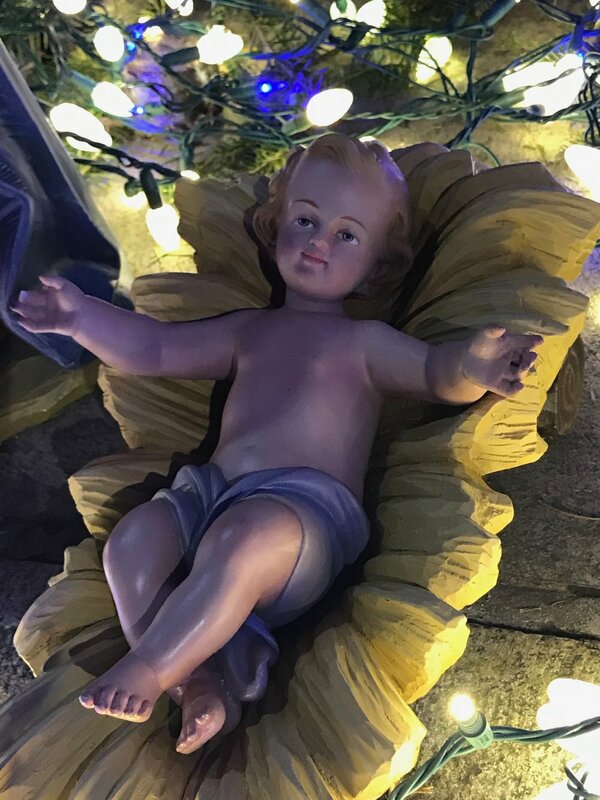 It was into this real world that the Savior comes, and you know what, even with broken fingers, or with feet askew, one leg smaller than the other. It was into our broken hearts that this baby was meant to be born, into the hearts that have been waiting for years through the miscarriages and failures of our lives, waiting, hoping and trying for something wonderful to be born. And it has. He has. And that’s why we rejoice, sing out from the bottom of our hearts through the streets of our city about the Prince who can show us the way through our brokenness to our holy perfection. Last night after the 4pm Mass I put the baby Jesus out into his crib between Mary and Joseph. Several people have worried that the figures would be stolen. Do you have a way to secure them, they ask. I just smile. Maybe someone will take the baby with the broken fingers. I hope not, but if they do, I hope that the incarnation will arrive for them too!